We recently took a "look at the tree colors" ride on the back roads to Hayward, WI, a tourist town full of shops and a giant candy and fudge store. Okay, maybe the ride was to stock up on candy for the long winter that is coming up, but the leaves were a good excuse. There is a wonderful Scandinavian store there that is a simply must-visit each time we are in town. 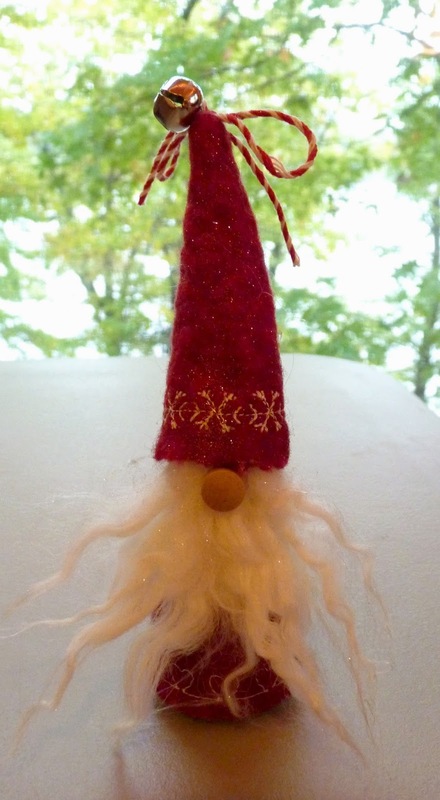 I love all the red, of course, but also the wonderfully simple and whimsical Swedish decorations. I have been loving the bottle topper elves that I have been making, but elf figures caught my eye at the store and I thought I could make one! We stopped at Bargain Bills in Rice Lake on the way home, and I bought a 3 1/2" wooden doll form. I cut some red felt to fit the form, stitched on some hearts on the hem, and some snowflakes on the hat. I got out my glue gun, and in no time at all, I had a new friend. Of course, I had to spritz him with glitter. I did some internet searching for wood doll forms, and discovered that this form actually is a female form - narrow on top, but wide on the bottom. The male wood doll forms are straight up and down. I like the chubby shape of this elf, so underneath his furry beard he is all girl! This little guy will be cute on a window ledge with some like buddies, or could be hung on a tree. Felt, glitter and glue....heaven! Jerilynn P.S. Happy October! One of my favorite months! Your elves are really fun! Thank you for all your comments! Let me know if you want the elf pattern!